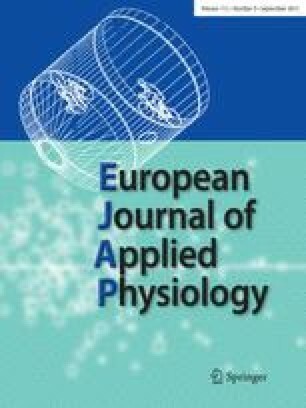 To investigate longitudinal effects of age on heat-activated sweat gland density and output, eight healthy active men (mean age 65–70 years) were retested after 5-years using 60-min passive heating [by placing the lower legs and feet in a 42°C water bath while sitting in a warm chamber (35°C and 45% relative humidity)]. Their height, body mass, surface area-to-mass ratio, mean skinfold thickness, resting systolic and diastolic blood pressures, pedometer readings and estimated maximal oxygen uptake did not differ over the 5-years. During the 60-min exposure the increase of rectal temperature was significantly greater in the second test than in the initial test (P < 0.05), although mean skin temperature, metabolic heat production and heart rate did not differ. Total body sweating rate was significantly less in the second test than in the initial test [210 (SEM 13) vs 253 (SEM 16) g·m−2·h−1, P < 0.02]. The mean body temperature at the onset of sweating on the thigh was significantly higher in the second test (P < 0.04), but not on the back. Local sweat rate (msw) had decreased significantly on the back in the second test (P < 0.001), but had not changed on the thigh where it had been smaller (compared to younger men) in the initial test. The decreased msw, on the back was due to a lower sweat gland output (SGO) per gland, but not from the recruitment of fewer glands. In contrast, the sweat gland density on the thigh was less in the second test than in the initial test [72 (SEM 4) vs 86 (SEM 7) glands · cm−2, P < 0.03], but the SGO which had shown considerably smaller values in the initial test remained unchanged. These results would suggest that sweat gland function decreased over 5 years in healthy active men in their sixth and seventh decades, despite their having similar physical characteristics and exercise habits. Furthermore, the decline did not occur uniformly over the body surface and it is suggested that it may well extend from the lower limbs to the trunk.